RJ Lawn & Landscape has partnered with family-owned Seasonal Concepts to bring this well-known brand back to Des Moines. Many in Des Moines will be familiar with Seasonal Concepts long tradition of providing the highest quality in outdoor furniture backed by great CUSTOMER SERVICE. Many might wonder "So what happened? Why did Seasonal Concepts leave the great state of Iowa?" Years ago, the original owner of Seasonal Concepts retired and sold the company off in two parts. The new owner of the Des Moines store did not continue the solid principles of the original company and eventually went out of business. The new owners of the other half of the company, however, were very interested in continuing the traditions of Seasonal Concepts. One of them, Marc Acord, a Burlington, Iowa native and long-time store manager, wanted to continue the original owner's solid principles of showcasing high-quality and high-style outdoor furniture with the BEST customer service. Today, Acord co-owns the business and in addition to retail stores in Kansas, Missouri, Oklahoma, is pleased to announce RJ Lawn & Landscape is bringing Seasonal Concepts back to IOWA! Visit our indoor/outdoor showroom to see what great pieces are available in stock and by custom order. We'll deliver right to your home without all the hassle! 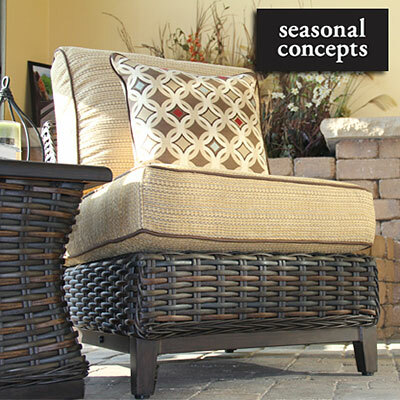 As Seasonal Concepts' new Iowa store, we are proud to continue the tradition of great customer service and excited to offer quality outdoor furniture by the finest manufacturers including Hanamint, Woodard, Patio Renaissance, Ratana and much, much more.